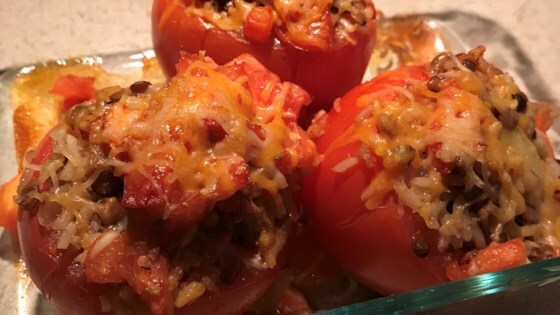 "These tomatoes, stuffed with lentils and oven baked, make a great entree." Meanwhile, melt butter or margarine in a saute pan. Add onion, and saute until golden brown over medium low heat. Stir in lentil mixture and mint. Season generously with salt and pepper. Really good but the rice and lentils needed to be cooked a lot longer. You could try this in peppers too! Will make again I'll just do it a little different. I topped the tomatoes with feta. They had an excellent taste and were very easy to prepare. Delicious. I too added feta and pine nuts. About the only other thing I would add would be some cumin in the rice/lentil mixture. Yum. This was very tasty. The lentils gave a nutty flavor. This was a good way to use up extra tomatoes from our garden, but this recipe wasn't a big hit at our house. Very easy to make and flavorful! !